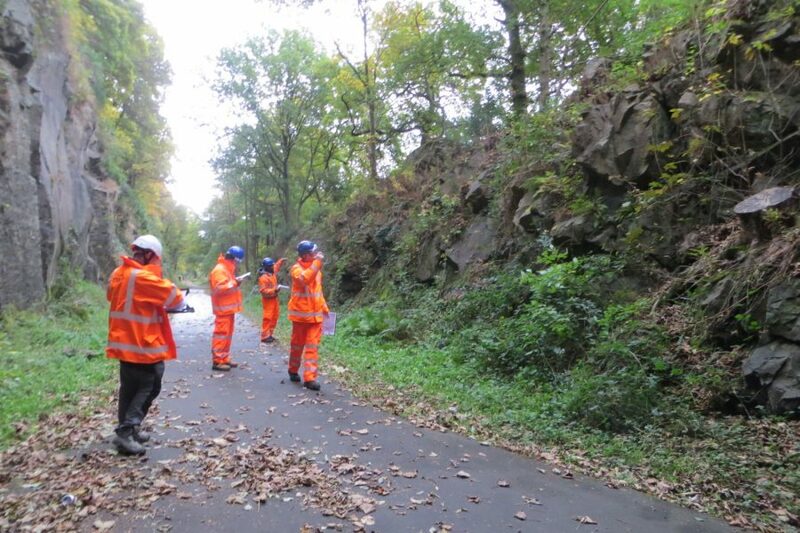 The commission comprises delivery of three-day training courses on data collection for the Rock Slope Hazard Index (RSHI), which is the system used to assess risk posed to the UK-wide rail network from rockfall. The courses are delivered on demand to Amey Earthworks Examiners (EE) and Earthworks Examining Engineers (EEE) who are responsible for delivery of cyclical inspections of all earthworks, as well as to Network Rail staff who evaluate the examinations in order to populate the upcoming work bank for remedial action. Network Rail standard NR/L3/CIV/065 “Examination of Earthworks Manual” defines the requirements and standards for the inspection of all soil slopes, soil embankments and rock slopes. The basis for Module 03, which covers rock slopes, was developed following adoption by Network Rail in the early 2000s of the rock slope risk management system utilised at the time on the UK highway network. Fairhurst delivered the commission to modify the system specifically for the rail environment, which involved a full review of the system from first principles. All earthworks are examined on a cyclical basis, the frequency of which is controlled by the condition of the earthwork. The examination of rock slopes requires completion of a standard data entry form on which information is collected relating to the slope geometry, proximity to rail infrastructure, rock mass structure, potential failures and existing remedial works. One of the core requirements of the system is that it is repeatable. In order to achieve this objective, all EE and EEE staff must undergo training, which is provided by Fairhurst engineering geologists. The course comprises a classroom-based day, presenting lectures on the background to the system and the technical basis behind the data being collected, followed by two field-based days in which delegates assess rock faces using the standardised data sheet. The final afternoon comprises an assessment which delegates must pass in order to carry out cyclical examinations. Fairhurst are the sole organisation to provide this training.